A new membership card has been launched this week for food and drink lovers in Worcestershire to make savings across the county. The Worcestershire Foodies Card has been put together by local food blogger Victoria Richardson, who is also known by her readers as ‘Pershore Patty’. It’s free for food businesses of any kind to sign up to the directory as long as they are based in Worcestershire, are independently owned and offer a service to the public. Participants currently include restaurants, pubs, cafes, bars, fishmongers and butchers. Food shops, cookery schools, distilleries, breweries and bakeries are also being encouraged to get involved. The offers listed on the directory will be exclusive to card holders only and will not be valid for anyone who hasn’t purchased a card. “Supporting local doesn’t exclude the chains,” says Victoria. “I just wanted to find a way to help boost our independents by showing people there is a wide choice. There’s been a recent increase in new and unique indies, which is great news for Worcestershire, but only if people are aware that they exist”. The directory resides on Pershore Patty’s blog, where anybody can view the offers and easily sign up online to purchase the cards. 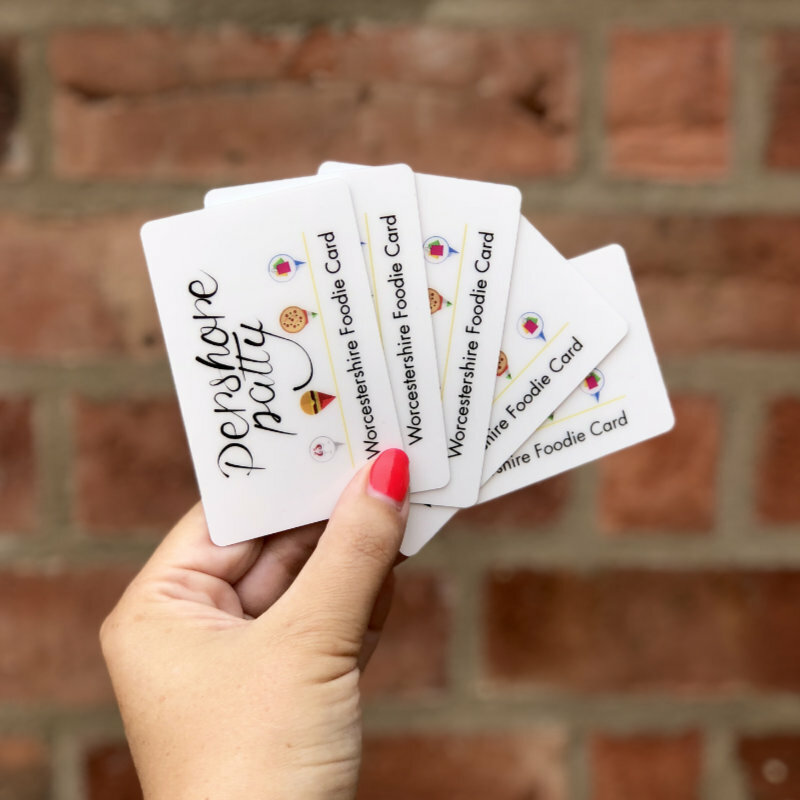 The Worcestershire Foodie Card costs £15 per year (or two for £25) and the cards are printed using an eco-friendly material designed to degrade within 39 months of their introduction to the environment, without any residual negative impact. There is an option to buy the card for someone else as a gift on the site for those wanting to treat friends, family and loved ones, or for local companies looking for a unique way to reward their employees. A social media campaign will be used to promote the card and its offers, encouraging card holders to get involved and using the hashtag #WorcsFoodieCard. “My main aim is to link great independents with people who share my love of food and drink, and with the support of my blog followers I’m confident that we will introduce some foodies to new restaurants which are offering exclusive deals to card holders”, explains Victoria. For more information and to get your Worcestershire Foodies Card visit www.pershorepatty.com the full list of participating independents can and their offers are here.